Does your fuse box need to be replaced? Your current fuse board does not have a RCD (residual current device). This is a sensitive safety device that switches off electricity automatically in a fraction of a second if it detects any electrical fault on your circuit, or the smallest of current changes. This minimises the risk of electrical fires, electrocution or electrical shocks. Your fuse board is more than 10 years old . Fuses can age through use, therefore if it is older than 10 years you should get it checked by a qualified electrician. A new consumer unit should be fitted and tested by a qualified, competent and accredited electrician. The device will be fitted with Residual Circuit Devices (RCDs) and mini circuit breakers (MCBs) and will meet the IET Wiring Regulations (BS7671:2008). 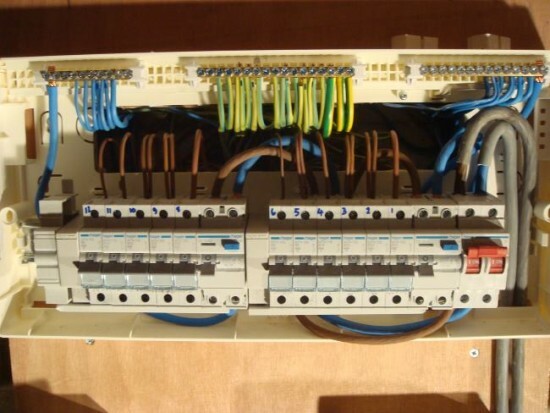 The current standards require split load fuse boards that have 2 RCDs. This means you will still have lighting and power if 1 trips. From next year all new consumer units must be metal. Plastic ones will no longer meet the latest regulations. Once installed we provide you with Certification for both the Electrical Installation and for Compliance with Part “P” of the Building Regulations. How much does a consumer unit cost to replace? It depends on a number of factors like the number of cables and space, but typically between £300-£500. Do you think you need to replace your fuse box either at home or in your business premises? We will be able to undertake this work to the highest standard at your convenience. Get in touch now for an electrician to come and provide a quote.